Ladies, each year we are drawn to the act of spring cleaning our homes. I invite you to do the same for yourself. 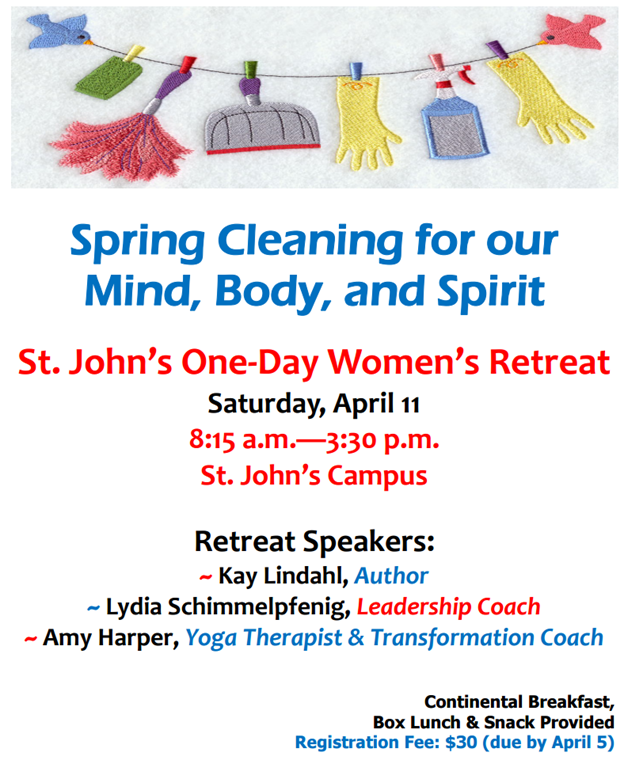 Join us as we welcome three very talented and inspiring women who will share with us ways to clear out what is not working, clean up what is, and connect with what we hold most dear. Kay Lindahl has been described as an inspired presence with passionate energy. For the past twenty years the daily practice of Centering Prayer has been transforming her life. She founded The Listening Center with the mission of exploring the sacred nature of listening. Kay conducts workshops and retreats on listening as a spiritual practice and is a Certified Listening Professional, and has written several books on The Sacred Art of Listening. She is a past trustee of the Global Council for the United Religions Initiative, an international movement to create peace among religions and is Past Chair of the North American Interfaith Network. She is a dedicated spokesperson for the interfaith movement, an ordained interfaith minister, and an Honorary Canon to the Cathedral Center of St. Paul in the Episcopal Diocese of Los Angeles. Lydia Schimmelpfenig is a member of both St. John’s church and school, and an active co-ministry leader to our Moms Club. Lydia also is a leadership coach, specializing in creating more authentic, and accountable relationships with each other. With two Masters degrees, one in Organizational Psychology and the other in Counseling Psychology, she helps her clients expand their perspectives and generate new life choices, and to always find humor in the process.Amy Harper is a yoga practitioner, yoga therapist, and certified transformation coach who strives daily toward balance – both on and off the mat. Many of you may be familiar with Amy, as she is our yoga instructor for St. John’s Spiritual Muscles Workshops and Lenten Quiet Day. Amy’s goal for us is to share how to use her disciplines from her yoga practice to make our lives better. How we move towards freedom in our minds and body by removing obstacles that hold us back. There will be registration forms available in the Church Narthex the weekend of March 14-15, but you are welcome to email DJ djgomer at cox.net to reserve your spot. However, please drop off your $30 check to the church office (no later than April 5). 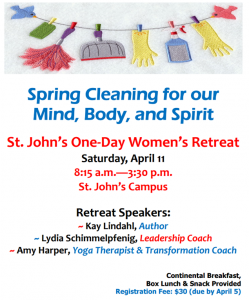 Checks are to be made payable to St. John’s Church, and please indicate it is for the retreat. Name, home address, contact phone number, email address, and if you are wanting a vegetarian lunch.